But alas, with time and effort, she is up and running and purring along fairly nicely now. However, even after getting her functional properly, I ran into quite the issue I’d like to share for people who may have a similar problem; Installing an encrypted Manjaro Budgie system, borked my system hard. The basic idea, is that I had Windows 10 installed on the machine in MBR/BIOS fashion, on my single 500GB Hard Drive. I then installed Manjaro Budgie (if you remember my Solus review, I really liked Budgie but felt it sluggish, so I wanted to try it on Manjaro,) and decided to use the LUKS built-in encryption in the installer. I did my usual partition setup; one for Manjaro, one for Windows, one for Swap. Unfortunately, GRUB refused to see Windows without some tweaking involved even after using things like os-prober. I was feeling lazy at the time and decided just to try firing Linux Mint Cinnamon onto the machine instead. Unfortunately, this became more of a hassle than I first realized, as the installer for Linux Mint refused to see my hard drive as a viable installation option. It simply was not listed. However it was quite visible through fdisk, lsblk, gparted etc. It took myself, and the ops in the mint support channel quite a bit of digging around, before one of them came up with the solution: somehow, the Manjaro Budgie install while creating the LVM for the encrypted installation, had fired some RAID information to the hard drive. The Linux Mint installer couldn’t see the drive, because it was told to bypass seeing it due to it being in RAID mode. But, it wasn’t setup for RAID, really, in any other way. Doing this, solved my issue, and then rather than retry the Manjaro install unencrypted, I simply installed Linux Mint Cinnamon. Not sure how common this is, or if anyone will find this useful, but I thought I would share. With that said, I am back, and articles will start flowing again: Now including gaming reviews, and installation tips focused on Linux! Mike describes how he fixed a Manjaro Bungie installation issue that somehow caused the internal drive to be in Raid mode without it being set up for it that way. Some time I had also similar issue with USB keys getting a weird partitioning scheme with ISO to USB key process, to test a linux distro for instance. So this is basically writing 5 megabytes of zeroes at the beginning, erasing MBR/GPT and allowing then to reformat properly the key/HDD, seeing again its complete size. Because without erasing the beginning of the key I was sometime stuck with OS refusing to reformat everything “from scratch”. I wonder if it would have done the same as the dmraid -E -r command. @Raphael: The best way to do this is to use wipefs(8), which is included in the util-linux package. It is capable of specifically identifying and scrubbing all signatures that are known to libblkid, meaning that it covers MBR/GPT partition table metadata and much more besides. Congratulations for your exams ! Oh wait…you’re not the author. It’s Mike’s article. Sorry about that. Scrap the other comment I just posted please (the one with the Crunchbase link in it). aha I have (on ‘nix and windows) run into that raid issue before ESPECIALLY when disk was set as dynamic disc. pita to figure out, easy to fix. Ubuntu Budgie is really nice. A person could spend a long time and a lot of effort tracking down such a problem. 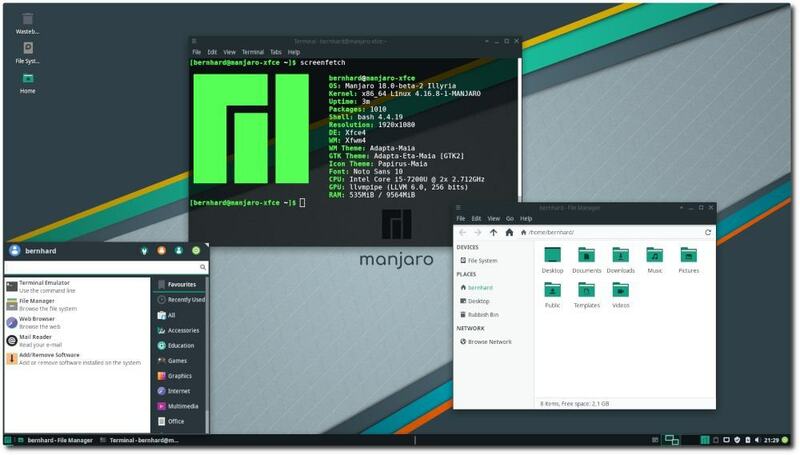 Why didn’t you install Manjaro Cinnamon instead?